A MAN was airlifted to Royal Brisbane Hospital last night after his truck rolled on the Warrego Hwy and scattered coal across the road. The incident, one of many crashes on the notorious road in the past two years, came in the wake of news that the State Government had allocated $219.9 million in the budget for capital improvements on the Warrego Hwy. 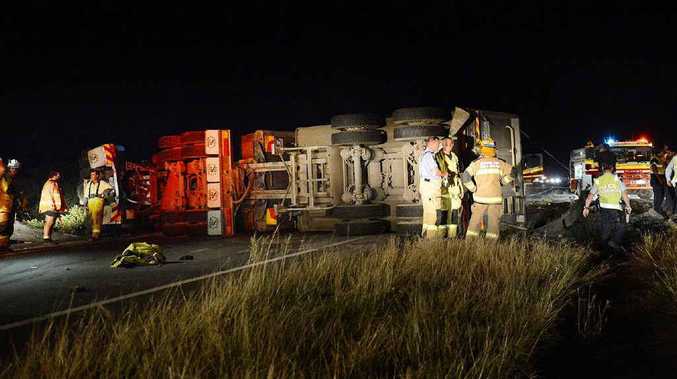 The accident occurred on the Warrego Hwy at Prenzlau between Hermans Rd and Mountain View Dr when the tail of a Mazda sedan travelling westbound in the slow was clipped by the front of a truck travelling in the same direction. The car went across the median strip and collided with a truck heading in the eastbound direction. The truck rolled and coal was strewn across the road. The driver of the car was not injured but the male driver of the rolled truck was trapped in his vehicle. He was airlifted to hospital with leg and facial injuries. Eastbound lanes were closed after the accident. One westbound lane was closed due to the spilt coal and once it was cleared away the westbound lanes were used to detour traffic in both directions. Do a Google search of 'Warrego Hwy' and 'crash' and numerous accident stories in the QT will appear from just the past two years between Ipswich and Toowoomba. That is why Ipswich West MP Sean Choat has welcomed news that numerous capital roads projects have been funded in the budget to upgrade the road. Mr Choat said that includes over $2.5 million in embankment works at the junction of Tallegalla Two Tree Rd and the Warrego Hwy. "There is also $3.3 million for pavement rehabilitation ... a 20km stretch around Minden," he said. "We also have $224,000 for miscellaneous works at the intersection of Fernvale Rd and the Warrego. From the foot of the Range through to the Ipswich Motorway needs a lot of work and I am pleased there is some serious dollars here to do that."